Wat Ton Kain is located at Nong Kwai Harng Dong to This place is a beautiful old temple. Points of Interest is Chaturamook hall, which one is the only one hall in the north. 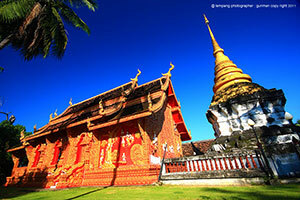 The traditional Lanna art in this temple is regarded as a complete and very valuable. Association of Siamese. Architects Building Conservation Award was announced as the year 2532.